Our new RBAC system uses nested groups – an admin is a member of a role group which is a member of a group authorizing access to a resource. Not every non-MS system is able to “understand” nested groups ( such as Cisco Ironport anti-spam appliances) so you are forced to use some sort of iterative\recursive query to make it work but luckily the Netscalers have a feature called “nested group extraction”. you will be able to use nested groups to authorize your administrators to perform management tasks on the Netscalers. We solved this by using a different policy/server pair for admin authentication/authorization. – We have an etherchannel (Nortel Avaya SMLT if people are interested) like setup where we use 2 ethernet interfaces on the Netscalers connected to our core switches and we have all our VLAN’s trunked on those ports (including the VLAN where the NSIP’s reside). – HA monitoring is only enabled on the channel not on any of the individual ethernet interfaces. What happened was that traps were sent out saying that both nodes missed HA heartbeats – but when we logged into the Netscaler GUI the HA status was fine. When taking a closer look at the snmp trap data it appeared that no HA heartbeats were seen on the two ethernet ports that were enabled but not connected – even though HA monitoring was disabled on these ports. We couldn’t really override this because the SNMP trap could only be enabled or disabled for all interfaces, so we disabled the interfaces. The only drawback is that we’ll need to use the console port if we can’t reach the Netscalers through the “etherchanneled” interfaces. We use a Microsoft Forefront Threat Management Gateway 2010 server array as forward proxy servers. Instead of using a autoconfig script, WPAD or the firewall client we use a load balanced VIP on our Netscalers to direct client towards the proxy. The setup is quite simple – a client connects to the VIP on port 8080 and the Netscalers sends the request over to TMG. Because we want the second proxy server to be passive we use a backup VIP instead of two services behind the first VIP. Now one of the advantages of a hardware load balancer in this scenario over a software based load balancing solution (such as vanilla or TMG integrated MS Network Load Balancing) is that a Netscaler can be configured in such a way that its application and even application performance aware if you want. We were only looking for application awareness – especially because we ran into situations where TMG said it was happy, SCOM said it was happy and there was more then enough cpu, memory, network resources and bandwith to go around – but clients weren’t able to get a single page from the Internet. But TMG has such a special place in my heart that I’ll devote an entire post to it later this week. Anyway – Netscaler to the rescue. This is what I wanted to do: build a monitor that retrieves a website through the webproxy server. That’s been done before: How to Configure an HTTP-ECV Health Monitor for Internet Proxy Servers . But that was for an unauthenticated proxy server.It did give some pointers on how to configure it with authentication. And luckily we allow Basic Authentication (using ntlm should be possible I guess using the right perl script) so all seemed well. First I’d like to point out that I’ve moved from using the GUI to using the CLI to configure things such as new vservers and monitors. I’ve been in a situation twice where a change in the GUI didn’t come through properly – even after saving and refreshing all. Secondly – the method in the article mentioned above doesn’t work :(. I tweaked the parameters and headers over and over but either TMG didn’t accept the request or the Netscaler couldn’t find the pattern in the response. I did some tracing with Network Monitor but even when TMG sent back a proper 200 status code the Netscaler said the service was down. But at some point I found another Knowledge center article: How to Configure a NetScaler Monitor to Authenticate with a User Name and Password. I quote: “Do not use an HTTP-ECV monitor when sending additional headers such as authentication, host, and so on.”. Wow silly me – how did I ever get that idea…?? The receive string here is not 200 but 302 because that’s the redirect we get when we request http://www.citrix.com (or http://www.google.com for that matter). To prevent a failover when a single website is offline for some reason,I’ve made two monitors and bound them to each service, each going to another url and using another user account so that we can prevent an account lockout ruining our day as well. Then by setting the -monThreshold parameter on the service to 1 and giving each monitor a weight of 1 I can ensure that the service is up if one of the monitors is successful. I hope someone will find this information useful – one small disclaimer: Basic Authentication is not encrypted – just encoded – and therefore basically clear text. Monitoring Citrix Netscaler Load Balancers with SCOM 2007 R2 Part III. This is part three of my series on monitoring Citrix Netscalers with SCOM 2007 R2 ( Part I and Part II). Now, does it work? And how? As said in my previous post the way the information is presented is a little bit different then with other MP’s. For each SNMP trap sent the pack will raise an alert – and the alert will tell nothing more then the fact that the SNMP trap has been sent 😉 If you make a config change you’ll get an alert that it has been changed..but not what has been changed. That information is shown elsewhere. Then there is the Health Roll-up of the entity. The health monitored health categories are Availability and Performance. Performance is based on some SNMP GET based performance metrics of both the appliance and the vservers. Availability is based on the state of the appliance alone and so if a vserver is down the Netscaler Device entity will still be healthy. And last but not least – the Netscalers themselves also allow you to tune what SCOM will report because you can enable/disable and configure its SNMP traps. You can do this from the GUI by opening System\SNMP\Alarms. Depending on the type of alarm you can define the alarm and normal thresholds, the time interval and the alarm’s severity. Whatever you configure here will direct influence the way SCOM will report about these events. Of course its also possible to override the rules and or alerts in SCOM but personally I prefer to do this at the source. I hope this guide will help others to get this MP running in their environment and possibly even convince others to choose this method of monitoring Netscalers. Monitoring Citrix Netscaler Load Balancers with SCOM 2007 R2 Part II. This is part two of my series on monitoring Citrix Netscalers with SCOM 2007 R2 ( Part I ). In the previous post I discussed why we decided to use SCOM to monitor the Netscalers, the MP’s installation and the Netscaler’s configuration. 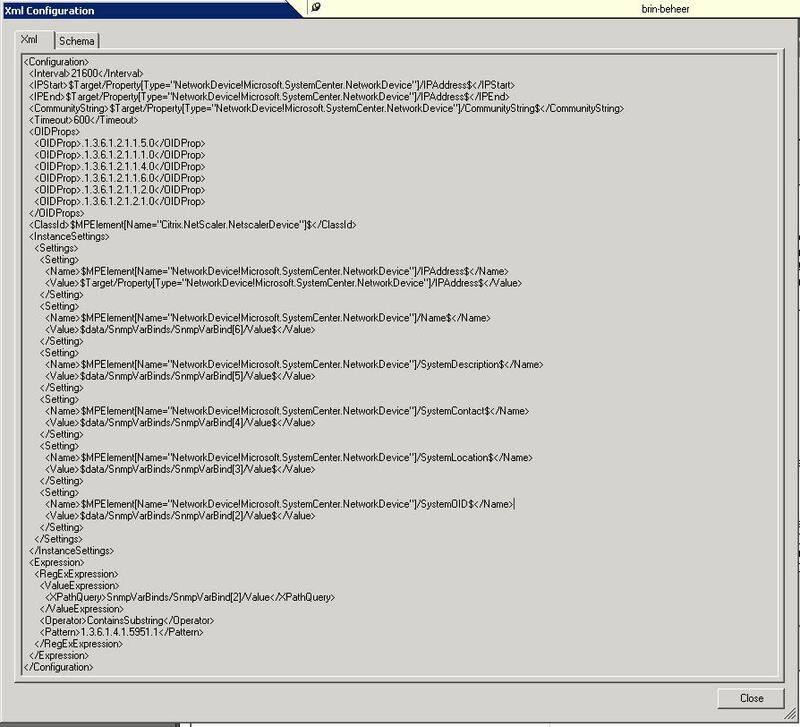 In this post I will discuss discovering the Netscalers in SCOM and the general usage of the MP. The Netscalers need to be discovered as generic network devices. After they’ve been discovered a scheduled discovery will discover them as Netscaler devices based on their SNMP OID. After that another discovery runs to identify the installed features and modes. 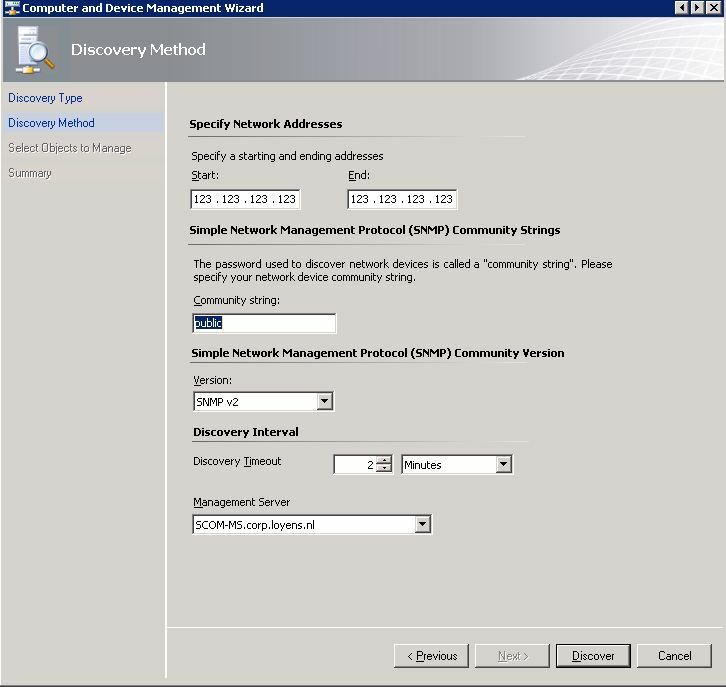 Open the SCOM console, choose Administration and start the Discovery wizard. Specify an ip range that includes both your NSIP’s. This leads me to the Citrix Knowledge Center article I mentioned earlier ( Case Study: When installing…Error Message ). I downloaded the MP from the Citrix Community page and installed that over the version I had downloaded from MyCitrix and after a reboot the discoveries did identify the modes, features and attributes. The root node – this contains an alerts view, a config changes view and events view and a Network Diagram. The Device state node – this shows has two views: Active Devices which lists all the primary nodes and All Devices which shows all nodes. Alerts seems pretty self-explanatory however it is important to note that the alerts contain little information. You’ll know a rule has triggered an alert but not why. Same goes for the Config Changes. Both will tell you there has been a alert or a config change, but the actual data is in the events view. Here all events (be it triggered alerts or snmp traps or config saves, changes, reboot etc) are logged with all the data provided by the SNMP GET or trap. The network Diagram was a bit of a disappointment, I would have hoped to see the Vservers and the services in there as well. The performance views are grouped into several categories, ACL, IP, SSL etc. None of the rules and monitors are enabled by default. Which brings me to a point of criticism – why are all rules and monitor disabled by default and then overidden with an override that’s stored in main Citirx Netscaler MP? Again something that goes against Best Pratices. Actually most performance counters aren’t active (or have an override by default)when you install the pack – you’ll need to override them one-by-one to be able to get that data into SCOM. This is where a tool such as OverrideExplorer ( I used v3.3. ) can prove to be invaluable, since for each category there are several snmp get rules and in order to fully populate the performance views you’ll need to override all of them. Using this information you can override the performance rules in bulk using Override Explorer. Then you are ready to go. In the next part I will show the MP in action and show how you can configure and enable/disable the SNMP traps sent by the Netscalers. Monitoring Citrix Netscaler Load Balancers with SCOM 2007 R2 Part I. We recently introduced two Citrix Netscaler clusters into our environment. The first cluster was already running as a Citrix Access Gateway cluster (as an upgrade from our Secure Gateway – needed to support Citrix receiver on IOS devices), we purchased a load balancing license for that cluster and are using it to load balance servers in our DMZ. The other cluster is used to load balance servers in our internal network. We mainly use the load balancers to create what I call “controlled redundancy”, but we do use it for several critical applications, such as the before mentioned XenApp environment. And one of the key elements in achieving this state of controlled redundancy in my humble opinions is being able to monitor these clusters. Citrix offers an excellent application to monitor and administer their line of networking products called “Command Center”. But our central monitoring solution is Microsoft SCOM 2007. Of course we could have decided to use both products side-by-side or try to engineer some connector between Command Center and SCOM. But since the number of management task we have to perform on our Netscalers is very small – and the fact that Citrix has a SCOM MP for the Netscalers – we are now managing the two cluster using the GUI and SSH for the time being and installed the SCOM MP. In this series of posts I am going to show how we installed, configured and tuned the management pack. I’m also going to cover the configuration of the Netscalers and the usage of the Netscaler pack – mainly because its structure is a little different then most standard Microsoft MP’s. We use vSphere as our virtualization platform so I have no experience with the PRO MP’s that are provided to use SCVMM PRO TIPS – so all I can say about that is that its unfortunate that there is no comparable feature for vSphere. I found that link in this Citrix KB article: http://support.citrix.com/article/CTX122844 – which discusses an issue with this pack and a x64 OS. We actually ran into this issue but more about that later. Btw both downloads will get you the 2.0 version of the MP – there is a 1.0 version out there for older firmware builds. We have both a classic 9.2 build and a ncore 9.2 build in our environment and we use the 2.0 pack for both. The installation is pretty straightforward. We do all SNMP based monitoring from a separate management server so it made sense for us to install the MP there. The management pack can do SNMP gets and receive SNMP traps so you’ll have to enable the built-in SNMP service on the management server. You run the installer and then import the MP into SCOM. Now its time to configure the Netscalers! In order to configure the Netscalers to be monitored by SCOM there are a couple of things you’lll need to configure, but one of things that really bugged me was the fact that in order to properly monitor the cluster I needed to be able to add both nodes to SCOM – which basically means that you have to create your NSIPs in a routed part of your network, which is against Citrix best practices ( or somehow multi-home your management server of course). So besides configuring your NSIP so that it’s reachable and has SNMP enabled everything you need to configure is in the System\SNMP node of the Netscaler GUI. I’m not familiar with the CLI yet however your just as easily configure it there I guess. Choose Management Host to use a single IP, network for multiple. In our case we have a dedicated VLAN for our monitoring and management servers. This is that part where I ran into some issues – it took me some time to figure out I needed to use Specific as the type instead of Generic. You also need to define the Trap destination and port. Before,I mentioned you needed to use the NSIP to monitor the Netscalers, but that’s only for the SNMP GETS because you are able to set a cluster wide SNIP or MIP as the source address. Minimum severity and Community name are obvious however don’t be fooled by the parenthesis in the Community Name field – you actually have to enter your own string without parenthesis! That’s most of the configuration on the Netscalers – in the next two parts I’ll discuss discovering the Netscalers, how to tune and configure the monitoring process on both SCOM and the Netscaler and I’ll try to show a little bit about the structure and the usage of the MP – especially because its a little different then your ordinary Microsoft MP.